To provide daytime care to adults over 18 with mental and/or physical challenges in a protective environment. To promote optimum mental and physical function. adult day services center founded in 1983. We give caregivers a much-needed break from the constant care of their loved ones. Daytime care, in a group setting that promotes life-enriching activities, medical monitoring, nutritious noon meal and snacks, and socialization to adults in need. 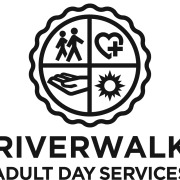 Would you recommend Riverwalk Adult Day Services?